WHO THE EFF HIRED THIS GUY? PINK SLIP YOUR WEBSITE! I visit a lot of websites. I’m online virtually all day, whether I’m working, browsing for products or catching up on social media. I look at websites on my large desktop monitors, one any one of my laptops and even on my smartphone. Though, I rarely look at websites on my phone for more than contact info, directions or to quickly checkout a restaurant menu. The best sites are those that I visit…and don’t stop to think about as a consultant. The best sites are those that I visit as a consumer and don’t stop to think about as a consultant. Those are sites that I visit, am pleased with the experience, efficiently find the desired information and move on with my day. The builders of those sites should be proud of their work. But, quite often, websites serve up speed bumps that slow me down. After clicking over to the site, I encounter confusing navigation, an unclear message or so much information that I have to take time to figure out how the respective company can help me. Could you imagine a retail store or a professional office that played by that rule? Did you get that? I—THE VISITOR—have to figure out how the company I’m visiting can help me! That is insane! Could you imagine a retail store or a professional office that played by that rule? If you meet me in person, at a business meeting or social event, I will passionately explain—and by that I mean via a moderately restrained rant—how so many websites, even big, expensive websites from companies that should know better, fall so short on UE—that’s User Experience for those of you not enveloped by marketing-speak every day every day every day! Treating the website as an afterthought, with no real strategy or investment. The website is a “DIY” effort undertaken by a friend, relative or employee that has little to no experience but to whom you have for some reason entrusted the creation of your primary gatekeeper. Too-good-to-be-true “free custom website” offers from large companies. “They built me a custom website…FOR FREE!” Why would they do that? Think about it. Embarking on the website build as either an IT project or a design project, when it is in fact a marketing project that includes IT and design. Your website is literally—LITERALLY—the first contact to your company for the vast majority of people that may become your customers. Even if they have met you in person. Even if you both attended high school or college together or were in the same fraternity and know each other’s deep, dark secrets, like that weekend in Tijuana senior year. Even your friends and relatives all visit your website to learn about what you do, how you do it and for whom you do it. Do you return to websites that confused and/or frustrated you? I didn’t think so! And, from that first visit, they make the decision whether or not to make contact and ultimately become a customer. When the website fails, they go away. Oh, you can hope that people return. But, you have to count on them not returning. Think of yourself. Do you return to websites that confused and/or frustrated you? I didn’t think so. If your website was an actual, living, breathing employee with the responsibility of addressing initial inquiries and establishing the first impression that 90% of potential customers will get from your company, at some point, you’d stand in the middle of your office, arms spread, looking up to the heavens–or whatever is above the drop ceiling panels and HVAC ducts–and loudly exclaim, “Who the EFF hired this guy?? ?” And, depending upon how upset you are, you may throw something against the wall, like your iPhone or an unpaid intern. Your website is not human and really should be easier to replace than a person. Let’s face it, nobody has to fear a disgruntled ex-website. At the same time, since the website isn’t taking up a cubicle, loudly speaking rudely to customers on the phone and stinking up the break room every time he or she reheats seafood leftovers, it is easy to let it cruise under the radar for a very long time. That procrastination will cost you and your company, substantially, as the website’s conversion rate languishes and visitors move on to your competition. Sure, I could wax on about statistics, and embed colorful charts and graphs–and maybe a photo of Steve Jobs because no modern article about tech or marketing is really complete without his picture. But, I’d rather leave you with a closing thought or two. First idea to consider: Your website is visited and experienced by potential customers, new customers and existing customers, as well as potential employees, partners, vendors and even investors. That’s pretty much everybody that financially supports your business. Each of their user experiences are integral to the success of your business. Like everything else about your business…your website requires an investment. Second idea to consider: Like everything else about your business that offers a RETURN, your website requires an INVESTMENT. Think about the average value of each customer. Is it hundreds of dollars? Thousands of dollars? Tens or hundreds of thousands of dollars? Multiply that amount by losing a single customer a week, and that will give you a good idea of how much income your website is giving away to other companies. It will also inform you as to how many customers a new website needs to deliver in order to pay for itself–and for most companies, the ROI is earned after only one or two new customers. For assistance with your marketing challenges, online and offline, please feel free to give me call, or go to www.atigraphics.com for more information about our services. 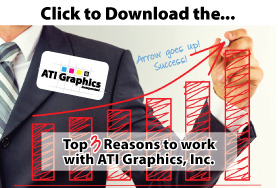 You can also click here to download The Top 3 Reasons To Work With ATI Graphics, Inc.